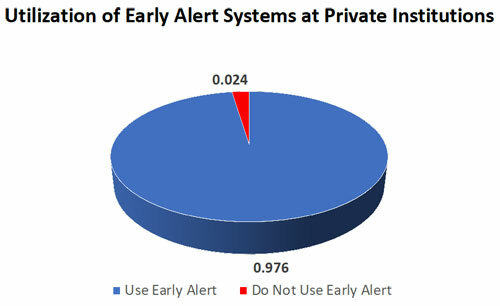 The Essentials for an Effective Early Warning System – Dwyer Education Strategies, Inc. Retention has become a critical issue for most colleges and universities. The importance of increased retention and higher graduation rates should be obvious. It is likely that colleges and universities are going to be held much more accountable for enrollment outcomes. It is reasonable to expect greater scrutiny by accreditors, politicians, the Department of Education and the public in general. As demographics become more challenging, competition increases and the market for prospective students continues to decline, institutions will need to seek new sources of revenue to survive. Even marginal increases in retention rates can have significant influence on overall financial health. For the majority of colleges and universities, research indicates that the most effective approach to better retention is a process that tracks indicators for at-risk students and provides appropriate intervention such as academic support, counseling, mentoring, encouragement and financial assistance among others. While many schools have early alert programs in place, they are often flawed, underfunded, overly complex and ineffective. What are the basic structures necessary for an effective early warning system? The most effective early warning systems begin with leadership at the top of the institution. The president or chancellor must place the early warning system as an institutional priority. Such programs are less useful if support comes primarily from the Student Services or Academic division. Presidential leadership touting the importance of the program in a public manner strongly and often is best. The program should be mentioned at campus community meetings. Leaders should provide updates on progress and outcomes at every Board meeting. Identification of at-risk students should be a formal process in the Admission Office. Admission professionals are most likely to have had telephone and personal relationships with most of the deposited students. Communication with admission applicants can inform areas of concern such as family problems, financial challenges, social fears, motivation deficits, lack of self-esteem, expectations and more. Professionals in the Admission Office also have access to levels of academic preparation such as standardized test scores and high school and college academic transcripts and the quality of courses taken. 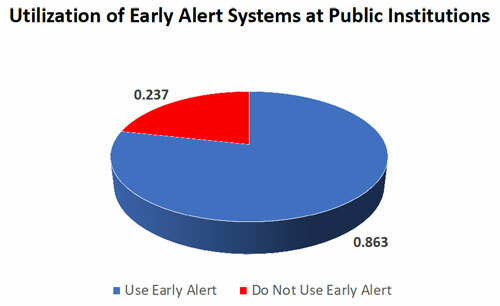 Early warning systems require broad participation across campus. Schools often focus on faculty as the primary source for referrals. It is important that everyone on campus participate in the referral system including faculty, administrators, coaches, office staff, food service personnel and even the cleaning and physical plant staff. Broad participation will not occur overnight. The importance of participation must be sold by the chief executive officer as well as the leaders in cabinet constantly. Consider public recognition and awards for faculty, administrators and staff who participate. Convey success stories of students referred and subsequently saved. Include early warning system participation in job descriptions and employment contracts as often as possible. Proactively explain the importance of retention and graduation rates for budgets and accreditation as well as the impact of positive outcomes on recruitment and fundraising. Willingness to participate in making referrals for at-risk students is only half the battle. It is extremely important that colleges and universities make it easy for faculty, administrators and staff to make referrals. Make it clear that you are looking for referrals and not necessarily solutions. We would be happy to just find out if a student is experiencing difficulty; it is not expected that the person making the referral must also intervene to find the solution. Technology is a must. Asking personnel to make referrals by completing paper forms or complex electronic referrals is not going to work. There are a number of good companies providing excellent, easy-to-use, inexpensive software designed to make the process easy for participants. Purchasing appropriate technology from companies such as Pharos Resources is a solid investment. It makes no sense to try and reinvent the wheel on campus when there are good companies offering proven solutions. The greatest investment for an effective early warning system is to hire or designate a group of professionals to monitor the tracking process and intervene to assist students regardless of the issue. It is not realistic to expect faculty, administrators and staff who already have full-time jobs to also take on the task of intervention and follow-up after a referral. These individuals must be equipped to recommend appropriate advising, academic support, financial assistance, tutoring, mentoring and student services help. I have often visited colleges and universities with early warning systems where fewer than 30% of the referrals are acted upon because there are no clear lines of responsibility and accountability for follow-up. When the effectiveness of early warning systems in research is mixed, it is probably due more to lax structure, lack of investment and low priority of the approach rather than the concept itself.